The AATSP Institute participants. Photo Andrés Fernández. When ALBA launched its Teaching Institutes for secondary school teachers in 2008, the program focused on issues related to the Spanish Civil War and the motivations of the American volunteers of the International Brigades to undertake the dangerous business of going to war to help another country. Given the climate of U.S. politics in the 1930s—an era of appeasement and isolationism—it was appropriate to ask: When should one government intervene in the affairs of another country? When, if ever, should private civilians violate laws to participate in foreign wars? And in what ways were U.S. volunteers validated by the subsequent outbreak of World War II and the tremendous human suffering that followed? Using ALBA’s large and unique collection of archival material, we introduced teachers to the stories of various volunteers, such as Hy Katz who wrote to his Jewish mother about why he went to Spain to protect Jewish people in other countries from the fascist menace, or the Jamaica-born volunteer Canute Frankson who explained to his friend in America why he, as a black man, had to fight against racist degenerates who supported Jim Crow laws and lynching. We placed the story of the Abraham Lincoln Brigade in the context of the coming of World War II and the Holocaust. 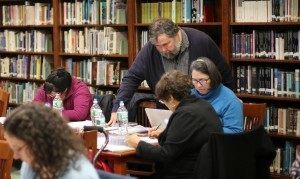 James D. Fernández works with Spanish teachers. Photo Andrés Fernández. Human Rights Education is a necessary element of social studies programs. If you don’t address these questions in classrooms, no one else will. Carroll’s talk integrated primary sources—such as Spanish children’s drawings in wartime and letters describing bombings of Spanish towns—with the narrative of human rights issues that foreshadowed the tragedies elsewhere. From the bombing of the Basque town of Guernica by German and Italian planes in 1937, Carroll showed teachers how to continue that theme through Allied and German bombing of open cities during World War II, ending with the atomic attacks on Hiroshima and Nagasaki. Besides creating enormous civilian casualties, such strategies also created refugee populations that demanded humanitarian aid. Ultimately, these horrors led to the Nuremberg tribunals and the U.N. Declaration of Human Rights. ALBA kicked off the teaching year with three institutes for high school teachers, bringing together nearly 100 educators to explore ways of incorporating the legacy of the Lincoln Brigade into their classrooms. In Cambridge, Massachusetts, in a day-long program co-sponsored by the Massachusetts chapter of the American Association of Teachers of Spanish & Portuguese (AATSP), and Collaborative.org, ALBA’s James D. Fernández (NYU) and Carlos Ramos of Wellesley College brought their archival projects and cultural studies to teachers of Spanish in the Boston area. Amelie Baker, a teacher at the Boston Latin School and member of collaborative.org, also offered a discussion sponsored by the Library of Congress on strategies for the effective use of primary source materials in high school classes. On Election Day in November, 38 high school teachers from New York City, as well as a few from Connecticut, attended the workshop led by ALBA’s Chair Emeritus Peter N. Carroll and James Fernández. Teachers from a variety of disciplines studied documents written by Spanish Civil War volunteers like Evelyn Hutchins, Canute Frankson and Hy Katz. They discussed, for example, how a Spanish folk song that had been transcribed, arranged and recorded by Federico García Lorca would end up being sung, with transformed lyrics, by the legendary Paul Robeson. And together, the teachers worked out ways to make these types of primary sources available and meaningful to their students. The following day, Carroll and Fernández also ran the most recent teaching institute at Bergen County Academy in New Jersey. The workshop was held in the classroom of history teacher Sergei Altschen, an alumnus of the very first workshop organized by ALBA in 2007; both Sergei and Gabriela Calandra, a Spanish teacher at Bergen, and also an alumna of that same institute, explained how they have made ALBA a center piece of their teaching ever since. Andrés Fernández Carrasco, a recent graduate of Wesleyan University, is ALBA’s newly-appointed Education Coordinator.